Bariatric surgery is like other major surgeries, but then again, it isn’t. The difference is the goals. For most major surgeries the goal is to recover so that you can get back to life how it was before surgery. Bariatric surgery is different. The goal is to not necessarily to get back to life how it was. Right? Instead, the goal is to recover and move forward in new and better ways. We find that the more mentally and physically prepared a person is before bariatric surgery, the smoother their journey is after surgery. To do this, the preparation is the key. Talk to people who have already had weight loss surgery. Attend support groups. Ask questions and receive answers in a supportive environment. Form a network to share recipes and exercise tips. It’s important for you to know that you are not alone. There are knowledgeable, friendly people available to support and help you. Journal about your experience. Record how you feel now, why you are seeking bariatric surgery, the obstacles you encounter, the things you hope to be able to do after surgery. Explore how you use food. Is it just for physical nourishment? Emotional? Entertainment? Boredom? Are you “addicted” to certain foods? Consider seeking consultation with a therapist to address your relationship with food. This may help ease the transition from the way you are eating before surgery to growing stronger in healthy eating habits for long term success after surgery. Help your friends and family members understand why you’ve chosen bariatric surgery as part of your treatment plan. Direct them to this website. It’s important that they understand that morbid obesity is a disease and that diets alone don’t work for you. Let them know your health is at stake and you will be counting on them to help you during and after surgery. Restrict yourself to a clear liquid diet 12-24 hours before surgery. Restrict yourself to a full liquid diet for 7-10 days before surgery. Stop all smoking or chewing tobacco use for at least 3-6 months before surgery. Be certain to follow your surgeon’s instructions regarding any medications you may be taking to control other health conditions. Begin taking two showers a day a few days before you enter the hospital. Use a good soap. Wash very well from your breasts to below your waist. Make sure to clean between any folds of skin. Arrive on time to the hospital, with supplies from home for a 2-3 day hospital stay. If you use special equipment for sleep apnea, you should bring your machine to the hospital. Do not have weight loss surgery while you have any other acute medical problem. If you are getting a cold or have a sore throat, ear infection, kidney or bladder infection, open wound or sore or unexpected dental work, call your doctor. It may be safer to reschedule your surgery. After carefully evaluation, Ben chose surgery. To prepare for the surgery, Ben worked with a trainer to develop a workout program as well as with a dietitian to rethink his eating habits. He also joined a weight-loss support group. Ben’s surgery was successful. 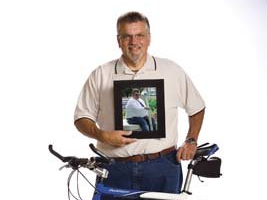 Not only did his diabetes disappear but so did 200 pounds!